One of the earliest patents for a car alarm system was filed by two Portlanders, St. George Evans and Edward B. Birkenbeuel, on March 5, 1918. The objects of our invention are to provide a means for automatically signaling an attempt to move an automobile by unauthorized persons; and to provide a means for locking the electric circuit open, in which case it will be impossible to move the car by its own power. a controlling switch board for setting an alarm upon leaving car, and releasing it upon returning to same, or for opening the ignition circuit to prevent operation of the car. 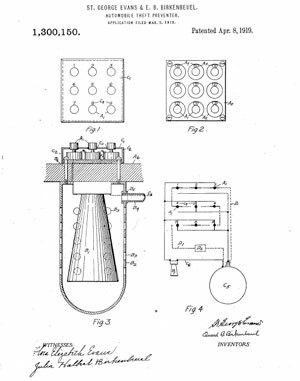 The patent was approved on April 8, 1919. Mr. St. George Evans was from Astoria, and married Florence Elizabeth Baker in Portland in 1912. His wife’s name appeared frequently in The Oregonian society pages of the era, and she was active with the Willamette Chapter of the Daughters of the American Revolution. Finding more information on Mr. St. George Evans, however, proved elusive. Mr. Birkenbeuel, whose trade is described as “Public Draftsman” in Morning Oregonian Portland business listings of 1918, received several patents in his lifetime. He also wrote frequent rambling letters to the editor.